AMD’s new A10-7890K is their fastest APU to date – but should you just wait for Zen? While gamers and enthusiasts set their sights on AMD’s upcoming new generation of Zen processors and the 40% instructions-per-clock improvement they promise over the company’s current hardware, Team Red are busying themselves in the interim by refreshing their current APU lineup with new models like this A10-7890K. It’s the fastest A-series chip currently available, carrying a $165 price tag. But is now really a good time to invest in a new AMD chip, or is it better to wait for Zen’s arrival? Keep this whole hardware malarkey simpler with our best PC gaming mouse guide. They point, they click. 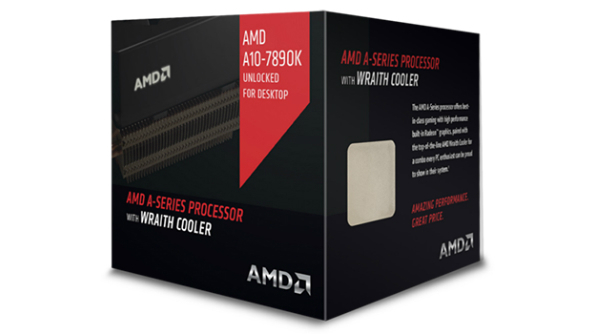 Like its contemporaries, the A10-7890K allows DDR3 RAM speeds of up to 2133MHz and operates at a TDP of 95W. It adds some headroom over the 7870K’s base and turbo frequencies though, running at 4.1GHz and 4.3GHz respectively, to the 7870K’s 3.9GHz and 4.1GHz. The onboard graphics component remains the same as its slightly cheaper stablemate, though, still powered by Radeon R7 architecture clocked at 866MHz. All in all, it looks positioned to go toe-to-toe with Intel’s cheaper i5 processors. By contrast, Zen processors look likely to stretch Intel’s more powerful (and more expensive) i7 CPUs with their top end models – and you can expect their pricing to reflect that. There’ll be cheaper models too, but not necessarily right away. As with their graphics cards, AMD will be likely to stagger the release of the full Zen range, so while they may end up releasing a new chip at around that same price point, and bolstered by all the benefits of their FinFET 14nm manufacturing process, you could be waiting a while if you’re holding out for new hardware at that price. It comes down to that age old debate about whether to buy old hardware when it’s at its cheapest, or wait for the pricier, more powerful kit. Except… that only works to an extent with PC hardware, since components seem to be irritably good at holding their value throughout their generation, and even beyond it. Find me a decent price on a GTX 780 right now, for example. See? Vintage wine depreiates quicker than PC kit. Harrumph.